The agenda (right) typically reveals nothing beyond the entities making presentations, so here are some questions that should/might come up. Note that B4 (18 Sixth) and B15 (664 Pacific, with school) are expected to start this year, but no specific schedule has been announced. B12 and B13, the two remaining sites on the project's southeast block, also are expected to start this year or next. 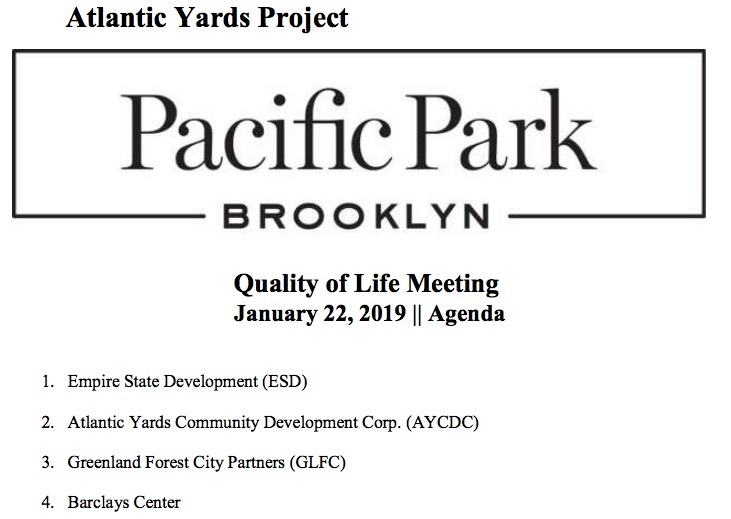 What about the full project, which has until 2035--or 2025 for the affordable units? There's a long percolating plan for Site 5 and unspecified plans for six towers over the Vanderbilt Yard (which need a deck). How does the developer plan to meet the obligation to provide 1,468 more affordable housing units--part of the obligation to build 2,250--by 2025? Will those apartments be dispersed throughout the full buildout, as once planned? If so, how can that aggressive buildout meet the 2025 deadline? Or, if those units would be concentrated in the next few buildings, what might the configuration be? And if the latter is the plan, well, what would be the unit mix in buildings after that? Would the entire project contain more than 2,250 subsidized units? What's going on at B4? 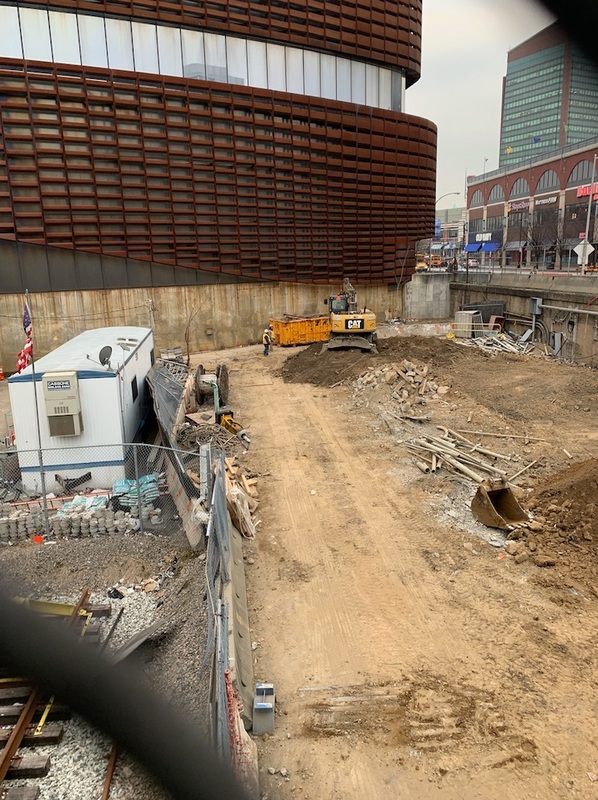 There's been some activity at the B4 site, at the northeast corner of the arena block, as indicated in the photo at right. According to the latest Construction Update, the only activity is the "the demolition and removal of the existing Substation equipment and structures west of the 6th Avenue Bridge." So presumably that's part of the railyard, not the future building. But we should learn more. So what's the current timetable for completion? 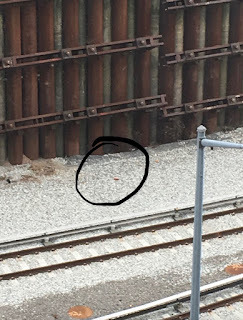 The demolition of two buildings that "bump" into the Vanderbilt Yard below Atlantic Avenue finally proceeded last year, slowly, since the location, adjacent to the railyard, requires demolition by hand, not machine. 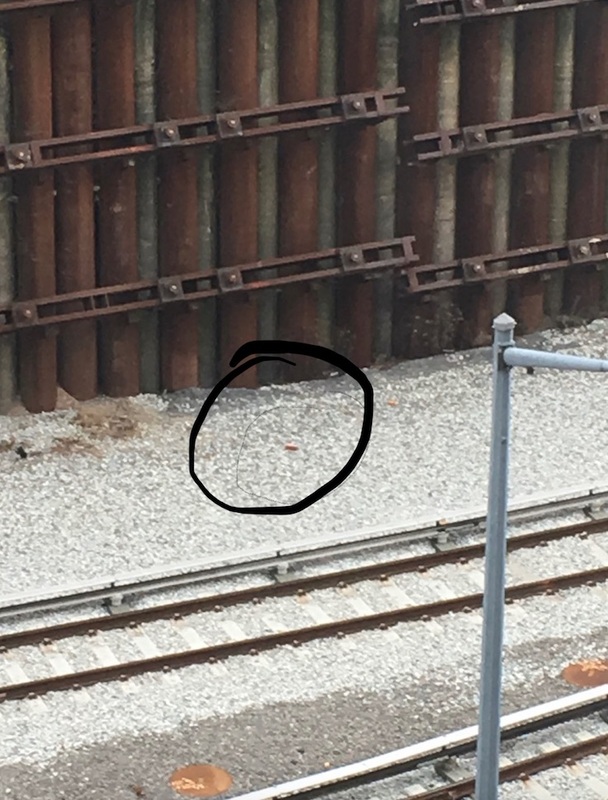 The photo at right, I'm told, shows a brick that fell into the railyard, which is surely not part of the protocol. Perhaps we'll learn about the progress and the safeguards involved. 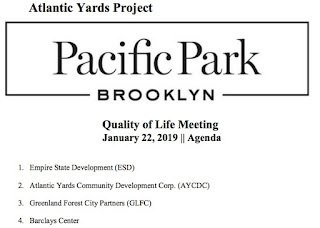 When is the next Atlantic Yards Community Development Corporation (AY CDC) meeting? It hasn't met since last March--its second meeting of 2018--though it's supposed to meet quarterly. Also, it has several vacancies. The AY CDC has been mostly toothless, but its meetings are webcast, and sometimes the developer and state are asked relevant questions about such things as the project timetable, so it can add transparency. 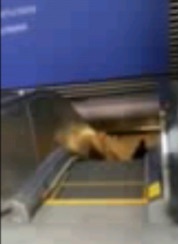 The down escalator at the Barclays Center was supposed to be up and running by Dec. 14, after an outage lasting about three weeks. But there were multiple extensions of that date, and I was told it was back by Monday, January 14, at least. Still, if this happens again, there's good reason to question the estimate. Open space at Times Plaza? What's happened to plans to upgrade the open space at Times Plaza, the triangle just below Flatbush Avenue at Fourth and Atlantic? The design had been approved by the Public Design Commission, said Tobi Jaiyesemi of Empire State Development last May, but there was no timetable for the work.